One of the great traditions in the Cape, is pickled fish. And in the early days of the Cape, it is speculated by Dr Hettie Classen in her book, Die Geskiedenis van Boerekos, that it was the Dutch who brought the spices to the Cape when they first arrived here in 1652. They had for years before been buying spices from the East through Italian traders who in turn brought them from Eastern traders who had brought the spices in camel trains along the well known trading routes, the Silk route being one of them. Exciting things are happening in Franschhoek on La Motte Wine Estate where Hetta van Deventer, Director of Cuisine and Executive Chef Chris Erasmus are making a study of early Cape foods and recipes – and serving them up to lucky guests in the restaurant on the estate. 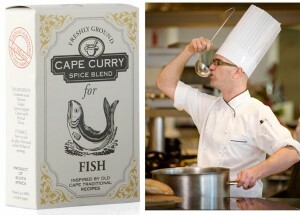 I have been playing around with their curry powders, they have them for beef, chicken and fish and changed my old recipe to use their fish curry powder. Few Cape homes would not have their own recipe for “kerrievis” as pickling was a popular way of preserving fish in the days before refrigerators. Often served as a first course, pickled fish is served as a main course with a salad of potato and accompanied by some dressed lettuce leaves. Cook the fish two days ahead of requiring the dish. Pat the fish dry and dip into the seasoned flour. Fry in the hot oil for about 4 minutes on each side or until golden brown and cooked through. As the fillets are cooked, remove and drain on kitchen towels and allow to cool. If desired, the fish can be brushed with oil and baked for about 25 minutes in an oven heated to 180C. Prepare the pickle. Fry the onions gently in the vegetable oil until they are transparent but have not lost their crunch. Add the curry powder, turmeric, paprika and coriander. Fry over gentle heat for a short while to release the aromatic oils from the spices. Add the remaining ingredients [except vinegar, water and fresh bay or lemon leaves] and cook gently for 2 minutes. Pour over the vinegar and water gently to prevent splashing. Over high heat bring to the boil, turn down the heat and simmer the pickle for ten minutes. Construct the dish by pouring a bit of the pickle into a glass or china dish. Place a single layer of the fish on top and cover that with pickle. Build up layers of fish and pickle ending with a layer of pickle on top. Place the fresh bay or lemon leaves on top. Cover loosely and allow to cool completely. When cold, cover with clingwrap and refrigerate for two days. Serve the pickled fish with the marinated onions and a little bit of the sauce. It goes without saying that you should be drinking a glass of La Motte Sauvignon Blanc or Chardonnay with this wine, but the reds, if slightly chilled offer an interesting taste combination experience.